The quest for creative photographic freedom is founded in the notion that the camera should essentially disappear from the photographic equation. The camera should be as much as possible an extension of the photographer's eye. Of course that sort of creative Nirvana is improbably difficult to reach if the photographer is constantly fiddling with an uncomfortable camera strap, constantly grabbing at a camera strap which is constantly slipping from a shoulder, and constantly shifting a poorly designed strap from one position to another. 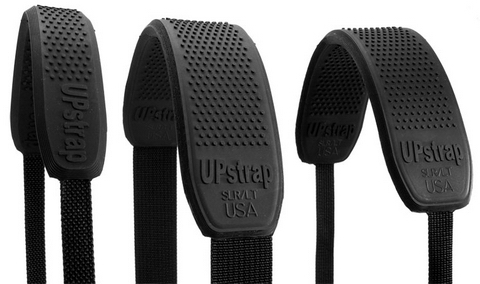 Al Stegmeyer, president of UpStrap, decided that enough was enough a few years ago and came up with a shoulder strap design that required a search for some very specific materials as well as fabrication that could meet his stringent design requirements. The result is a deceptively simple strap that is nothing short of stellar in both quality and function. The UpStrap is a combination of black, top quality strap webbing welded to a carefully designed and sized, studded grey shoulder pad. The studding and shoulder pad compound appear to be a molded and cut from a two piece blank between which the strap webbing is sandwiched. The flexible rubber compound used for the pad and its molded, cylindrical, flat-topped studs are extremely durable, have no obvious limit on their usable life. The strap and pad resist abrasion, accidental cuts and stains. The pad itself tenaciously grips all manner of smooth, slick, textured, rough, tight fitting or loose fitting clothing at any temperature from (-10 celsius to +40 celsius — the range of temperatures in which I've used my own UpStraps) without in any discernible way marking or otherwise abrading or damaging any clothing or outwear. Throughout temperature extremes, the pad remains fully flexible and functional. The webbing attaches and locks onto standard camera lugs with the help of a hardened steel thread-able strap buckle. If I sound like an UpStrap fan it's because I am. I started using these things a couple of years ago and haven't looked back. I've lost count of the number of times I've found myself leaning to get a shot at some precarious angle, climbing in and out of vehicles at odd angles, or just bending down to grab something out of my bag with a camera swinging securely from my shoulder held there by an UpStrap. Cons: When you're shooting at at angle that pulls the strap off your shoulder, the shoulder pad has just enough weight to disturb a shot if it swings loosely or if you shrug it off your shoulder and it bumps into you. The shoulder pad grips well enough to require the development of some new habits including a quick shrug in some situations to release its tenacious grip enough to give you some slack. A model which incorporates strap webbing that can slide back & forth through the shoulder pad (suggested by Kickstartnews Managing Editor Howard Carson, another UpStrap user) would be a welcome variation. UpStrap also does not yet make a strap end or quick release end with swivel attachments. The rubber shoulder pad compound is superb, but does not fold up like a cloth or elasticized strap, which means you will likely have to be a bit more careful when stowing your camera in your gadget bag and lifting it out of the bag. Pros: All of the various UpStrap shoulder straps are very well designed, very well made (in the U.S.), and work extremely well with everything from prosumer compact cameras to compact SLRs and the heaviest, bulkiest pro bodies & lenses. If you prefer shoulder straps above any other sort of carry, UpStraps will make you a true believer. All of the UpStrap models are designed to last for many, many years. They're amazingly secure while at the same time being gentle to clothing. UpStraps can hold a lot of weight and attachment to precious camera bodies is secure. Your camera & favorite lens combination may be inexpensive or it may be worth a King's ransom, but has to be secured and protected either way and I think the UpStrap is among the best secure carries you can buy these days. UpStraps are available online only. Customer service is friendly, efficient and rapid. Highly recommended.